Other Products: Pink Cardstock, Foam Squares, Hot Glue Gun, Twine, Spellbinders Platinum Die Cutting Machine. Instructions: Cut a 6" x 12" piece of pink cardstock, fold in half to create a 6" x 6" card base. Cover front of card with Camelia Carnation Paper Collection. Cut a smaller piece, distress edges and adhere to card with foam squares. Die cut Sweetheart Border from pink cardstock, adhere to left side of card front with glue. Stamp multiple Carnations and leaves with Small Camelia Carnation Cling Stamp Set with Fuchsia Pink StazOn Ink Pad onto Art Foam Paper. Die cut with coordinating Camelia Carnation Die. Color flowers with Berrylicious and Pumpkin Spice Chalk Ink Pads using Store Daubers. Color leaves with Guacamole Chalk Ink Pad. Heat flowers and leaves with Heat It Craft Tool just for a few seconds. 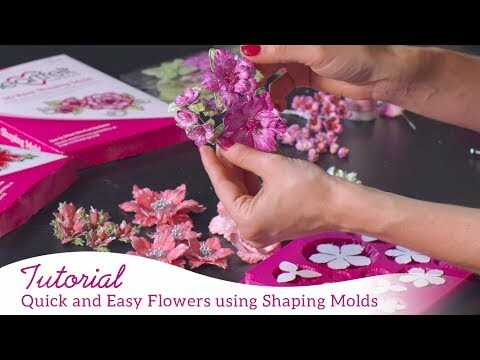 Shape flowers by twisting petals and using Flower Shaping Kit. Repeat with leaves. Layer several petals together with hot glue gun to make flowers, puncture a hole in the middle for the stamens. Adhere flowers and leaves to card as pictured. Make a bow with twine and glue under flowers. Cut out sentiment from paper collection and adhere to card with foam squares.